Another revolutionary specimen, Venezuelan Bolivar, will magically make your friends look like international freedom fighters. Don't forget to make them strike a heroic pose for this banknote. 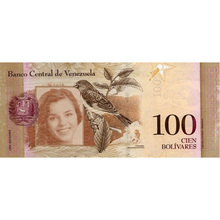 Have you ever seen the colorful Venezuelan 100 Bolivares banknote? Get the very best out of an exotic specimen. Let the arbitrary images appear on the banknote averse, as part of special entertainment!